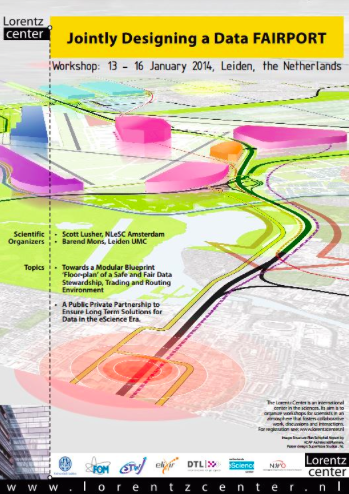 On the 13th to 16th of January 2014 the Dutch ELIXIR Node, in cooperation with the Netherlands eScience Center and the Lorentz Center, organized an ‘unconference’ titled: ‘Jointly designing a Data FAIRPORT’. During these four days key aspects of a global infrastructure for effective data publishing, discovery, sharing and re-use for eScience experimentation were discussed. The workshop brought together 25 high level participants representing leading research infrastructures and policy institutes, publishers, semantic web specialists, innovators, computer scientists and experimental (e)Scientists. Through a mix of moderated plenary sessions and break out groups the context, user needs, technological challenges, access & business models, funding requirements and governance of such a global initiative were discussed. The outcome of the meeting was a remarkable consensus about the best way forward. All participants agreed that a global infrastructure for professional data publishing, discovery, exchange and re-use is essential for effective data driven research, as well as addressing the data stewardship requirements that are increasingly demanded by science funders. The principle outcome of the meeting is that a backbone will be designed that will enable global interoperability of data. The key requirement for this backbone will be to allow as a very minimum that computers can ‘independently’ discover all available data sets for a specific research requirement. At the core of this ‘DATA FAIRPORT ecosystem’ will be a minimal protocol that will define basic semantic interoperability of datasets where possible using already endorsed or emerging community standards and protocols. Standards and protocols at the core of the DATA FAIRPORT would be endorsed by ELIXIR and sister initiatives around the world (such as NCO in the USA and SCIELO in Latin America) and DATA FAIRPORT compliant services can also seek endorsements from these authorities. The DATA FAIRPORT will also answer part of the needs expressed in the Interoperability Programme of Work of ELIXIR and the ‘Principles of data management and sharing at European Research Infrastructures’ under preparation in BioMedBridges. The meeting was financially and logistically supported by the Netherlands eScience Center, and by DTL as host of the Dutch ELIXIR Node. The magazine International Innovation published an article on the Data FAIRPORT meeting in her latest edition. You can read it here. This entry was posted in FAIR data, Event and tagged FAIRport, ELIXIR-NL, data sr=t.